To enjoy a quieter more pleasant elevator ride, RAM designs its in-home elevator with a Crystal Traction Sheave Drive. This drive offers a cleaner more efficient ride with a lower total cost of ownership due to inherent design features that avoid wear on the most critical parts. They use a fully counter-balanced design and high efficiency components rather than hydraulics. Hydraulics can give off unpleasant fumes in your home and have a winding-drum or geared-chain drives, which are prone to noise and inefficient operation. All Crystal Elevators from RAM are custom-built for your home. They are built according to the space you have available. RAM will customize your home elevator to fit your completed shaft construction to ensure a smooth installation every time. The electrical panel and all controls are easily accessed from within the elevator cab, eliminating the need for a separate machine room or control box. Guide system rollers are self-lubricating. 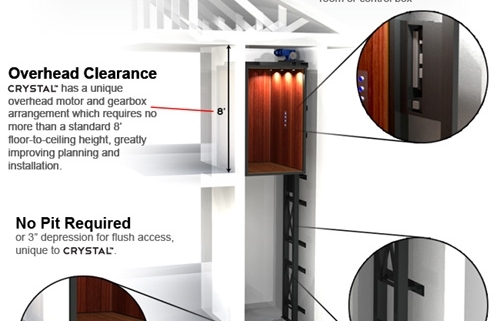 The Crystal elevator has a unique overhead motor and gearbox arrangement that requires no more than a standard 8’ floor-to-ceiling height, greatly improving planning and installation. 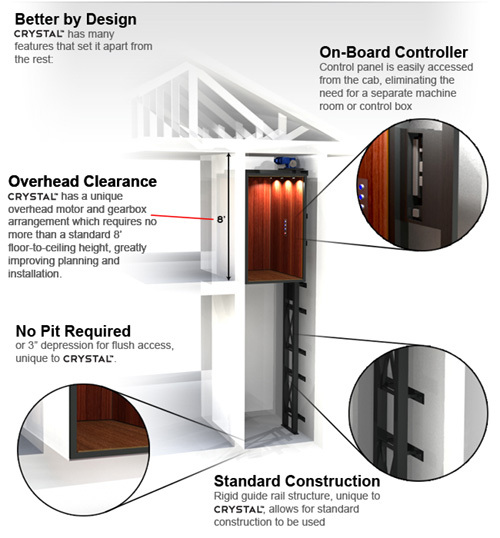 Only the Crystal elevator delivers flush access without the need for a pit or 3 inch depression. This can be very advantageous if you are working with an existing home. It will save the expense of digging out a pit that is required for many other products on the market. The rigid guide rail structure which is unique to the Crystal elevator system, allows for standard construction to be used. No special wall reinforcement is required, which lowers the overall project cost. 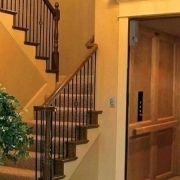 All components of the in-home Crystal elevators fit through a standard door opening so your residential elevator can be installed after it is built, rather than building it in your home. Maritime weather can be challenging. Thousands of homes and businesses experience power outages that can last days or weeks caused by wind, ice storms and floods. The RAM Tower of Power is a unique 220V full battery backup, providing an unmatched 40 lift cycles on reserve power. It is a stand-alone product and can be added to any new or existing Crystal in-home elevator. Automatically switching between building power and battery power, it provides the highest level of power reliability and peace of mind. The RAM Tower of Power can also be used to back up other home appliances in time of need. The Crystal home elevator from Ram is designed to last. Every Crystal elevator installed since 1990 is still working today!